A good hoodie fashion essential. Versatile and easy to wear with pretty much anything, the classic hoodie is perfect for throwing on and looking instantly stylish. Our Custom Hoodie is a real favorite at Contrado. This unique hoodie is cut and sewn by us, from our own pattern and features an entirely customizable design. Make your own hoodie, and choose from a pull-over or zip-up finish and then have fun creating your own designer hoodie. Whether you want to use photos, text or a unique design to customize your hoodie, you can be sure that when you design with Contrado, you will be getting a bespoke and one of a kind piece, handmade and printed exclusively by us with no minimum. This hoodie has several finishing options and seven printable areas including; both sleeves, the left and right side of the hood, the front, the back and the internal side of the hood. The designs on the sleeves and body are also printed onto the cuffs and hem, creating a totally customized hoodie, tailored just for you. A classic zipper hoodie is ideal for creating a stylish layered look. Our zipper finish hoodie features a sturdy zip and you can opt between three different color options. If zips aren't your style, then we recommend the pull-over hoodie option. This stylish hoodie allows you to print a solid design without interference from a zip. 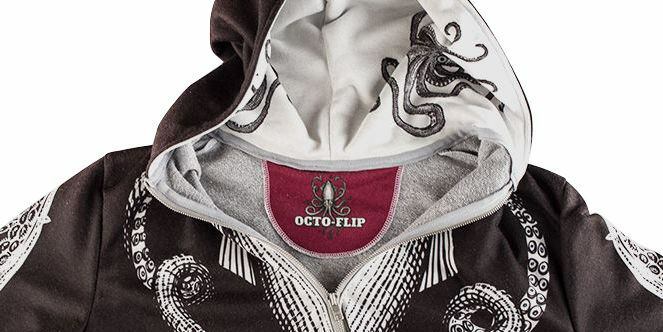 Custom printed hoodies are such a fun and contemporary way of showing off your personal style. Every hoodie is printed, and sewn by hand and is available with fast delivery with no minimum order, so if you are looking to create a hoodie just for yourself or a whole line for your own brand, Contrado is the only place to be. Make your own hoodie from our super soft Loopback Jersey. Printing on white Loopback Jersey will give you a bright and punchy print, while the grey version has a slightly more muted tone. This characteristic jersey fabric is full of personality and is unique due to its special kind of knit, which goes through the back loop and twists the stitch - hence its name. Promote your brand, with our sewn-in Labels. Our Custom Hoodies come with the option to add a custom label: this big, bold full-color label is a great platform to promote your brand. Print with your brand name or logo, add sizing information and more. You can even print a name or a personal message. Custom labels add a professional touch to your custom-made hoodies, and will get your brand recognized. From slogan hoodies to designer hoodies, one thing is for sure, this versatile piece is beloved by pretty much everyone! As such, you can really have a lot of fun creating stylish and laid back looks. With our zipper finish, we recommend layering it over our Cut and Sew Vest and topping it off with our Custom Beanie Hat, for a relaxed yet on-trend outfit. Our pull-over version is a great addition to skinny jeans and boots or worn under our Custom Bomber Jacket. Have fun mixing it up. To get the most out of your product, make sure you stick to these simple wash and care instructions and it should stay soft, colorful and happy. Because the fabric is soft it can pil (bobble) over time. To prevent pilling we recommend turning your garment inside out before washing, washing at 86°F, washing with similar soft garments and not tumble drying. The Best of the Best Contrado did it again. What a phenomenal hoodie. My Facebook lit up with so many likes and com ents,once I posted my picture with this hoodie on!! Great quality all around!! Already placed an order for more things. Cannot wait to see them!!!! good quality, missing customer service hi - very happy with the speed of turnaround and the quality of the product. was very unhappy tho, that i couldn't reach a human being to ask a question during the ordering process. left two messages and received 0 callbacks. room for improvement? Review Of Items Ordered Ladies Bomber Jacket - 5/5, Turned out great! Skater Dress 2/5 The Chain Jersey looks like it is a printed paper towel. Velvet or Velour was the other textile option, but not for a warm climate. I suggest a different textile. The dress looks cheap up close. The printing looks great though. Men's Large Hoodie Pull-Over Hoodie SCORE: 3/5 Print placement was off, but it turned out nice. Printing looks good. Nice construction and fabric. The label on the back is all messed up, and the logo and brand name are not as placed in the design tool. Women's Small Hoodie SCORE 4/5 Very well done. Print placement and printing are excellent. Leggings M (6-8), Capri, Slinky Matt Lycra SCORE: 3/5 Cute but print fades/ghosts when stretched. Runs extremely small. Leggings S (2-4), Lycra Soft Sheen Score: 3/5 Print ghosts when stretched. Size runs very small. Shipping was fast and reasonable for the USA, under 7 days. Customer service is very good. They answer all emails timely and are very much in touch with the customer. All of our printing issues would have been resolved if someone had just looked at the print layout prior to the fabric printing. It makes me reluctant to use the design tool again as each item was double checked on our side prior to ordering. Never have I been able to customize a hoodie how I did with this product. Really love it so far! Which parts of the hoodie can I customize? You can customize nearly every part of our personalized hoodie. Not only can you design the front, back, right and left sleeves and left and right external hood, but you can also design the interior fabric of the hood. There is no limit. You also have the option to choose your fabric, trim and stitch color and whether to add a brand label or message. What is the fit of this Custom Hoodie like? Our printed hoodie is comfy and super soft. We designed it to fit quite true to life, so the fit really depends on your style preference. If you want a regular fit, then we suggest your regular size. 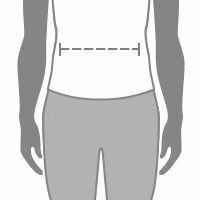 If however, you prefer a more fitted and slim fit hoodie, then go down a size and, alternatively, if you like a baggier, more relaxed look, go a size up. Can I print one image over the whole hoodie? This is an all over print hoodie. As our hoodie is cut and sew, it is not possible to print a single image over all 7 parts in one hit. Your design will be printed over the panels and you have the option to replicate the same design over all parts. You can design individual segments for each panel to get the image all over. Browse selected hoodies from our curated marketplace and support independent artists and designers. Designer Stripe Logo Pullover Hoodie. This hoodie is an awesome unisex garment: Ladies, please select 2 Sizes Smaller than their regular size to ensure an accurate fit. Our Hoodie is a regular loose fit. Our model Wofai is 6'1" with a 38" chest, 29" waist, and wears a size Medium.